A black man was asked to leave his apartment complex pool in Indianapolis last Friday after refusing to give his exact address to a security guard. 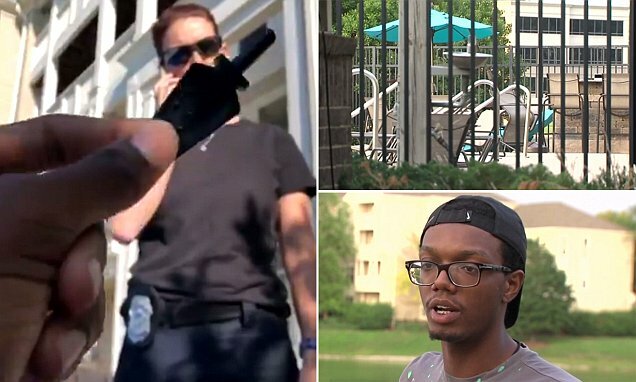 Shayne Holland, who had lived in the complex for more than a year, had been to the gym and was relaxing on a seat nearby the pool when he was approached by a guard, who was also an off-duty cop. He told the Indianapolis Star the woman approached him and asked for his address without identifying herself. Holland said he showed her his key to the pool area – something only available to residents – but declined to give her his exact address. In a video filmed by Holland, he is seen explaining why he won't tell the off-duty policewoman his address, and his property manager Candace soon arrives on the scene. The pair greet each other by name, and Candace confirms he is a resident, going as far as to mention his mother's purse is in her office for him to collect. Despite their clearly personable relationship, Holland is still asked to leave the pool area for refusing to answer the security guard's questions. 'I thought the ordeal would be over [when Candace arrived],' he told the Star. Holland claimed the guard had not spoken to anyone else in the pool area, further noting the other patrons were white. Speaking to WRTV, he said he 'didn't want to jump to racism', but couldn't help but notice he was the only black person at the pool and had been the only one ejected.